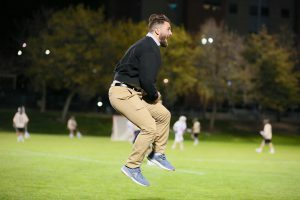 Episode 2 of the Utah Lacrosse Podcast features assistant coach Adam Ghitelman. Coach ‘Ghits’ is the mastermind behind the defense for the Utes and the wizard with the goalies. Join me as I talk to Coach Ghitelman about the upcoming season, the impact of the returning Ute poles and goalies, defensive schemes, lacrosse in developing countries, growing the game and more. The picture I choose for this episode is of Coach Ghits catching air after last years goalie goal by Quinton Swinney. I had spoken with ‘Q’ before the game and he said, ‘Watch out for a full field goal. We’ve seen the tape and we think we can get it.’ Sure enough, Q found the back of the net.